Where did Earth's global ocean come from? A team of Arizona State University geoscientists led by Peter Buseck, Regents' Professor in ASU's School of Earth and Space Exploration (SESE) and School of Molecular Sciences, has found an answer in a previously neglected source. 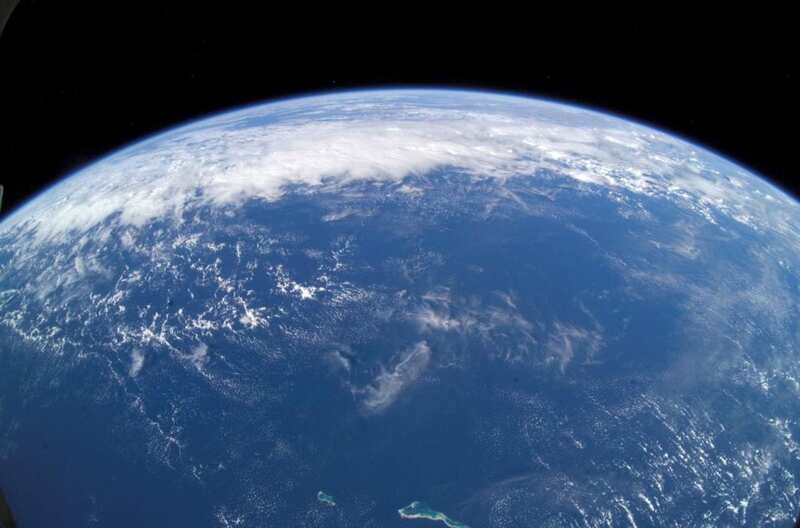 The team has also discovered that our planet contains considerably more hydrogen, a proxy for water, than scientists previously thought. So where is it? Mostly down in our planet's core, but more about that in a minute. The bigger question is where did all this come from in the first place. "Comets contain a lot of ices, and in theory could have supplied some water," says Steven Desch, professor of astrophysics in SESE and one of the team scientists. Asteroids, he adds, are a source as well, not as water-rich yet still plentiful. "But there's another way to think about sources of water in the solar system's formative days," Desch explains. "Because water is hydrogen plus oxygen, and oxygen is abundant, any source of hydrogen could have served as the origin of Earth's water." Hydrogen gas was the major ingredient in the solar nebula — the gases and dust out of which the Sun and planets formed. If the abundant hydrogen in the nebula could combine with Earth's rocky material as it formed, that could be the ultimate origin of Earth's global ocean. Jun Wu, the lead author of the paper the team has published in the Journal of Geophysical Research, is an assistant research professor in both SESE and the School of Molecular Sciences. He says, "The solar nebula has been given the least attention among existing theories, although it was the predominant reservoir of hydrogen in our early solar system." To distinguish between sources of water, scientists turn to isotope chemistry, measuring the ratio between two kinds of hydrogen. Nearly all hydrogen atoms have a nucleus that's a single proton. But in about one in 7,000 hydrogen atoms, the nucleus has a neutron in addition to the proton. This isotope is called "heavy hydrogen," or deuterium, symbolized as D.
Comets? With their higher D/H ratios, comets are mostly not good sources. And what's worse, the D/H of hydrogen gas in the solar nebula was only 21 ppm, far too low to supply large quantities of Earth's water. In fact, asteroidal material is such a good match that previous researchers have discounted the other sources. But, say Wu and co-workers, other factors and processes have changed the D/H of Earth's hydrogen, starting back when the planet was first beginning to form. Wu says, "This means we shouldn't ignore the dissolved solar nebula gas." The key lies in a process combining physics and geochemistry, which the team found acted to concentrate hydrogen in the core while raising the relative amount of deuterium in Earth's mantle. The process began quite early as the Sun's planets were starting to form and grow through the merger of primitive building blocks called planetary embryos. These Moon-to-Mars-size objects grew very quickly in the early solar system, colliding and accreting material from the solar nebula. Within the embryos, decaying radioactive elements melted iron, which grabbed asteroidal hydrogen and sank to form a core. The largest embryo experienced collisional energy which melted its entire surface, making what scientists call a magma ocean. Molten iron in the magma snatched hydrogen out of the developing primitive atmosphere, which derived from the solar nebula. The iron carried this hydrogen, along with hydrogen from other sources, down into the embryo's mantle. Eventually the hydrogen became concentrated in the embryo's core. Wu adds, "Besides the hydrogen that the embryos captured, we expect they also caught some carbon, nitrogen, and noble gases from the early solar nebula. These should have left some isotope traces in the chemistry of the deepest rocks, which we can look for." The team modeled the process and checked its predictions against samples of mantle rocks, which are rare today at Earth's surface. "We calculated how much hydrogen dissolved in these bodies' mantles could have ended up in their cores," says Desch. "Then we compared this to recent measurements of the D/H ratio in samples from Earth's deep mantle." This let the team set limits on how much hydrogen is in Earth's core and mantle. "The end result," says Desch, "is that Earth likely formed with seven or eight global oceans' worth of hydrogen. The majority of this indeed came from asteroidal sources. But a few tenths of an ocean's worth of hydrogen came from the solar nebula gas." Adding up the quantities cached in several places, Wu says, "Our planet hides the majority of its hydrogen inside, with roughly two global oceans' worth in the mantle, four to five in the core, and of course, one global ocean at the surface." Many of these exoplanets might have formed far from the zones where water-rich asteroids and other building blocks might have arisen. Yet they still could have collected hydrogen gas from their own stars' solar nebulas in the way that Earth did. The team concludes, "Our results suggest that forming water is likely inevitable on sufficiently large rocky planets in extrasolar systems." The authors of the paper are Jun Wu, Steven Desch, Laura Schaefer, Linda Elkins-Tanton, Kaveh Pahlevan, and Peter Buseck, all affiliated with SESE; Wu and Buseck are also affiliated with ASU's School of Molecular Sciences. The research was funded by the Keck Foundation. Based in Los Angeles, the W. M. Keck Foundation was established in 1954 by the late W. M. Keck, founder of the Superior Oil Company. The Foundation's grant-making is focused primarily on pioneering efforts in the areas of medical research, science and engineering and undergraduate education. The Foundation also maintains a Southern California Grant Program that provides support for the Los Angeles community, with a special emphasis on children and youth.